In the blog category “Book Reviews”, I will review many classic books written by teachers and practitioners of mindfulness meditation. I have been reading such books for more than 2 decades now. I will systematically review these books, one by one, so that it may help readers of this blog make informed decision about purchasing them and learning from them. In 2006, a broad-based study on sleep disorders was sponsored and published by the Institute of Medicine. Their findings were published in a book entitled “Sleep Disorders and Sleep Deprivation: An Unmet Public Health Problem”. The study revealed that an estimated 50-70 million US adults had sleep or wakefulness disorder leading to a staggering social cost borne by society at large. In light of these facts and statistics, the book entitled “Buddha’s Book of Sleep” written by Joseph Emet and published in 2012 is very pertinent. This book has the double mission of helping people to sleep better and also to serve as an introduction to mindfulness practice. Joseph Emet trained with the Zen master Thich Nhat Hanh at Plum Village in France. He was made a Dharma teacher in Thich Nhat Hanh’s tradition. He is the founder of Mindfulness Meditation Centre in Montreal, Canada. He has written four other books including “Buddha’s Book of Meditation” and “Buddha’s Book of Stress Reduction”. “Buddha’s Book of Sleep” is divided into two sections. The first section entitled “Mindfulness Meditation Training and its relevance for better sleep” explains why mindfulness meditation is appropriate for dealing with sleeping problems. He describes how mindfulness practice can be an exciting path of self-discovery as new insights unfold continuously. He talks about the discoveries we can make of our own minds and realize that in our busy minds thoughts (mostly negative) come and go automatically of their own accord. This leads to much anxiety that turns into sleeplessness. Furthermore, worrying about sleep becomes counterproductive to sleep. He describes how mindfulness practice does not make worrisome thoughts and feelings disappear but that it teaches us to put some distance between ourselves and our thoughts. We stop identifying with them as a result of which they lose their power and grip over us. In a chapter entitled “Here and Now” Joseph lists some simple but powerful tips and techniques that we can employ during times when we are unable to fall asleep. In a chapter entitled “Meditation and Action” he lists some principles and precepts that are revealed to us through our mindfulness practice. These principles and precepts have the potential to fundamentally alter our outlook on life and allow us to deal with adverse situations skillfully as and when they arise during daytime. When it is time to go to bed, we are therefore not bothered by them thereby allowing us to sleep better. Having set the stage for the usefulness of mindfulness meditation in the first section, Joseph goes on to the second section entitled “Guided Meditation Exercises” where he describes seven specific exercises to do at bedtime, in the early hours of morning or anytime we face sleeping problems. These exercises contain beautifully written affirmations (like the ones listed below) that can be used for meditation and reflection prior to going to bed or even during the times when we are having difficulty falling asleep. “Like a swing, my breath slows down at each end. “I count my blessings and send waves of contentment to every part of my body. I have had my share of sleeping problems. I was able to successfully resolve them by using a toolset comprising of mindfulness meditation techniques and relaxation techniques. One such tool was Joseph Emet’s guided meditation exercises. I recorded his affirmations in my own voice on my iPhone, introduced short periods of silence between successive verses and created seven tracks. I then played selected tracks when I found it difficult to fall asleep. The results were nothing short of a miracle. Hearing the affirmations brought an immediate sense of relief and peace to my mind as well as relaxation to my body. My natural sleep cycle immediately took over and put me to sleep. I woke up feeling fresh and well rested the next morning. 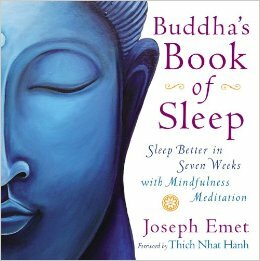 I highly recommend that you purchase this book and try out Joseph Emet’s guided meditation exercises if you have sleep problems. I am sure you will not regret this purchase. The “Buddha’s Book of Sleep” is a short book comprising of 135 pages written in style that is very easy to understand. In fact, Jospeh’s style of writing is very similar to the writing style of Thich Nhat Hanh. You will not fail to notice the heart element and the space of deep understanding and wisdom that is the source of this book’s contents. This book is available in many local bookstores as well as on Amazon. Check out the website of Joseph Emet’s Mindfulness Meditation Centre to learn more about his other offerings. If you have any questions on this book or if you would like to seek clarification on some of its contents or if you have your own suggestions to offer me, then please do so by filing out the contact form below. In a blog category entitled “Website content feedback” I will publish my answers to your questions as well as your suggestions wherever appropriate. Thank you !! !